A couple of weeks fly by in no time (especially when you’re away for one of them! ), but at last things are progressing. First of all the Beetle (oh – she has a name now – Penelope as in Pitstop) went in to Primrose Link garage in Clitheroe to make sure everything is roadworthy. There was a problem with one of the brake warning lights coming on, but after a new rear calliper and ABS sensor were fitted, plus a couple of new tyres, everything seems to be in order. Grateful thanks to fellow Rotarian Ian Harris of Primrose Link for providing free labour and parts at cost. 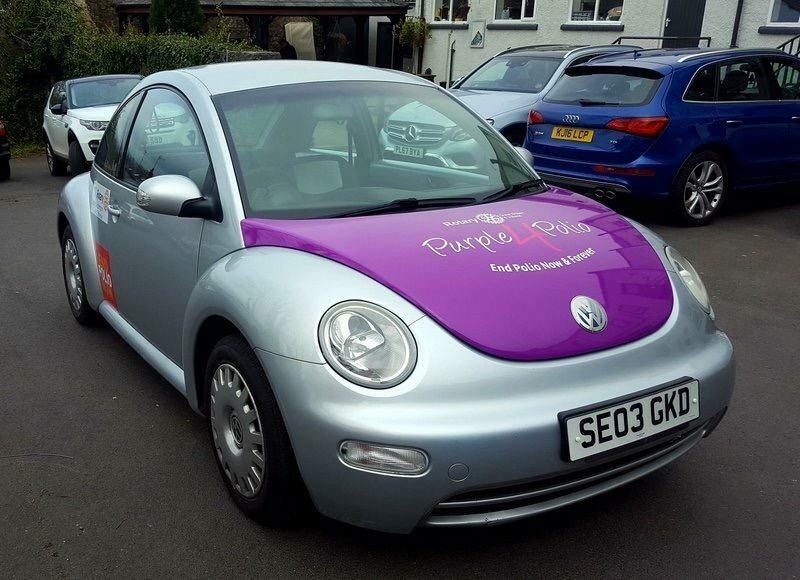 Then it was on to James Alpe Ltd of Clitheroe for Penelope to have her ‘party frock’ fitted – in other words a purple bonnet and boot, and a few logos for Rotary and the End Polio Now campaign. 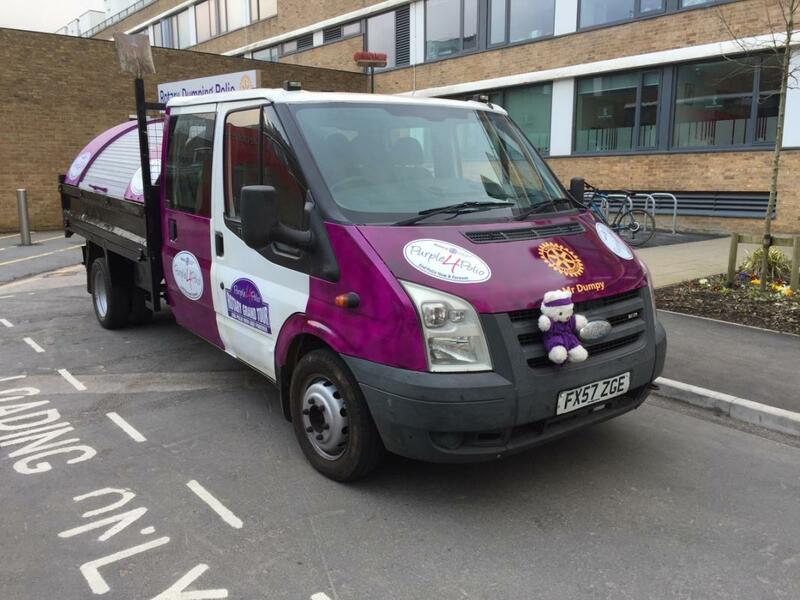 We also trimmed up the rear window with space for over 50 individual sponsors to sign their name on the car in exchange for a £10 donation, all of which will go to the cause and be TRIPLED by the Bill & Melinda Gates Foundation to make £30! We’ve also got sponsorship from Honeywell Estate Agents and PSG but over the next few weeks we’ll be increasing our efforts to get as much sponsorship as possible. So if you’re reading this and either have your own business, or know someone looking for good value publicity (we’ll be on local radio, in the press and on social media) then please get in touch with either Bill or Malcolm to discuss how you can add to the decoration on the car and benefit your business too! By the way, the other evening we took the car to a District Rotary Meeting, and met up with Mr Dumpy – a dumper truck converted by Roger Franks of Upper Eden Valley Rotary, the same man who built the working Iron Lung last year. For a moment we thought Mr Dumpy might eat Penelope, but she survived unscathed!